Kenya opposition presidential candidate Raila Odinga has rejected early results indicating a strong lead for his rival, President Uhuru Kenyatta. Mr Odinga told journalists the details were "fake", because the authorities had failed to present documents verifying the results. Electoral officials say that with 91% of results in Mr Kenyatta is leading with about 54.5%, to Mr Odinga's 44.6%. Many fear a repeat of the violence after a disputed election 10 years ago. More than 1,100 Kenyans died and 600,000 were displaced following the 2007 vote. Mr Kenyatta's lead could mean that he is elected outright. 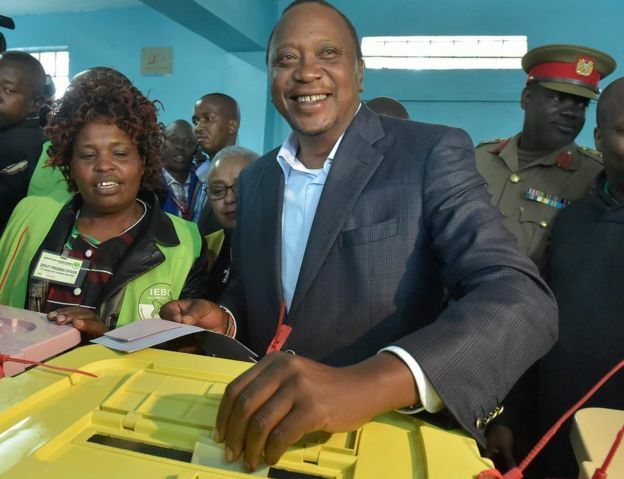 There were eight candidates in all, but apart from Mr Kenyatta and Mr Odinga none polled more than 0.3% of the vote. What is Mr Odinga's complaint about the vote? The opposition has described the results being released online as a "fraud" because they were not accompanied by original result forms 34A and 34B from the polling stations. "They are fictitious, they are fake," said Mr Odinga. He said that the results were "the work of a computer" and did not reflect the will of voters. "We have our projections from our agents which show we are ahead by far," he added. Opposition officials have said that, despite assurances from the electoral commission, they still have not received the result forms. What does the electoral commission say? The electoral commission has been urging people to wait calmly for the full results of Tuesday's vote. 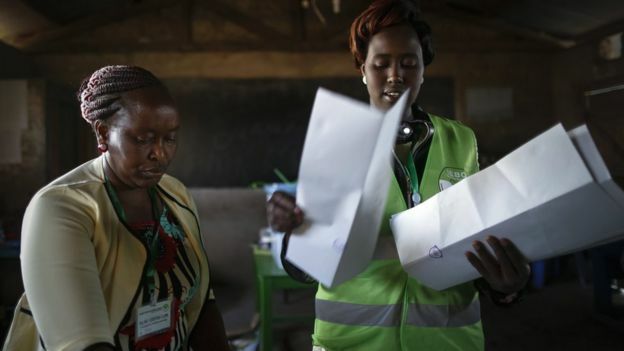 "During this critical phase, we urge all Kenyans to exercise restraint as we await official results from the polling stations and indeed as they start trickling in," the commission said. However, it admitted that a lack of mobile data coverage had delayed the delivery of the supporting documents, forms 34A and 34B. There had been reports on election day of the failure of some voter-identification equipment. Also, one in four polling stations were apparently without mobile phone coverage, meaning that officials were asked to drive to the nearest town to send results. The presidential candidates' agents would have "special access" to the forms, though, the electoral commission said. The Daily Nation newspaper quoted commission head Ezra Chiloba as saying only results supported by the forms had been published. How did the voting go? Voting passed off largely peacefully and some polling stations remained open after the scheduled 17:00 (14:00 GMT) closing time. People started queuing early to ensure they could cast their vote. 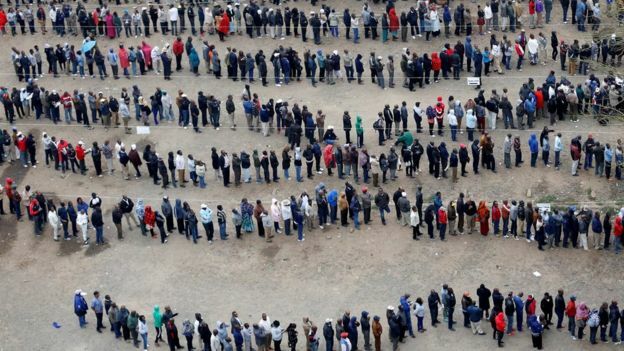 Long queues could be seen, and video footage at one polling station showed people injured after an apparent stampede. There were reports that one man had been killed in clashes in the Kilifi area. But there was one heartening moment when a woman gave birth to a baby girl as she queued in West Pokot to cast her ballot. New mother Pauline Chemanang called the circumstances of the birth a "blessing" and called her baby Kura, Swahili for "ballot", according to local radio. However, in the run-up to election day, a top election official was murdered, there were claims of vote-rigging and hate speech flyers and rhetorical text messages began circulating. Some nervous Kenyans stockpiled food and water, while police prepared emergency first aid kits in the event of violence. Mr Kenyatta is hoping for a second term in office. To win outright, a candidate needs more than 50% of the vote, and at least 25% in 24 of Kenya's 47 counties. If that threshold is not met, a run-off vote between the top two candidates will be triggered. Voting for the national and local assemblies has also been taking place. Mr Odinga, 72, has run for president three times and lost each time. President Kenyatta, the 55-year-old son of Kenya's founding president, beat him in the last election in 2013, but their rivalry is generations old - their fathers were political opponents in the 1960s. Mr Kenyatta and his running-mate William Ruto were indicted by the International Criminal Court for their alleged roles in the bloodshed a decade ago. The case ultimately collapsed due to lack of evidence, and after key witnesses died or disappeared.